Few of us are aware of the background of the drink consumed in every home from Buckingham Palace down to the lowliest cottage. Thanks to the help of Mr. Tim Smith, a most knowledgeable purveyor of fine teas, (and an American, no less!) I can pass on some interesting facts to share with friends. Just in case there is a lack of goss– er, amusing stories — to share at teatime. Worldwide, only water is consumed more often than tea. And he variety of teas boggles the mind. 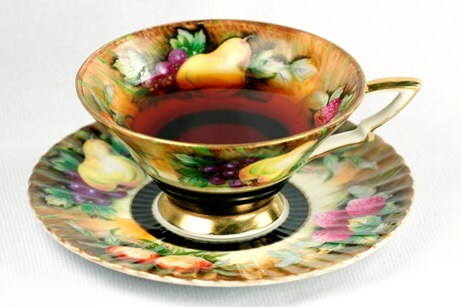 In England, we greet the day with a full-bodied black tea, such as English Breakfast or Earl Grey. In the afternoons, Oolong is preferred. Let us not forget green teas, used by the Japanese, and white teas. The latter do not seem to play a part in any formal ceremony, but Mr. Smith assures me he sells a fair amount of them in his shop, the Tea Smith. Imagine my amazement when Mr. Smith informed me that all those different kinds of tea come from the same plant, camellia sinensis! I thought he was jesting, but he assures me that it is simply a matter of how the leaves are prepared. All Quality tea starts with the two tenderest leaves and a bud from each branch of the plant. White teas are produced from leaves that are plucked, steamed, and then dried. To make green teas, leaves dry and wither somewhat before steaming, and afterwards, leaves are rolled by hand and dried near a source of heat. The delicate flavor of Oolong teas come from actually bruising the leaves after they are withered, to increase oxidation. Once the edges turn red, the leaves are rolled and dried. Black teas attain their deep coloring and rich flavor because they are made from leaves they are left to oxidize completely before rolling and heating. One hears rumors of a something called a ‘tea bag’, in which the lowest quality of tea, referred to as ’fannings’ or ’dust’, are gathered into paper envelopes attached to a string. How Revolting! How can one indulge in the frivolous but charming pastime of reading one another’s tea leaves? As any Civilized Person knows, good tea can be reused after the initial steeping. Furthermore, the leaves, once the flavor is completely brewed out of them, make excellent compost. Or an economical household will strew the damp leaves over the rugs each morning and then sweep them up, thus removing dust. Tea bags, indeed! The dashing botanist Robert Fortune introduced tea plants to the Darjeeling province of India by smuggling them out of the hinterlands of China. The writer cannot help but Wonder how the entire East India Company missed the species of tea plant growing one province over, in Assam. Possibly the observant eyes of females, so used to noticing important details, could have prevented this Embarrassing Oversight. On a happy note this means we now have access to India’s camellia sinensis assamicus in addition to the Chinese plant. Mr. Smith says that he imports teas from not only China and India, but from Kenya, Taiwan and Japan. By the first two names, he refers to parts of the globe labeled on my maps as British East Africa and the island of Formosa. (One is concerned about the teaching of Geography in the United States.) I have included his address below, in case any reader should like to investigate his wares. How interesting. Who would have thought?? Thank you for stopping by, April. Nice to see you!